Thanks for visiting my website. If you are looking for help to deal with unwanted behaviour from your dog, I will be happy to help. As a Bark Busters therapist and dog owner for many years, I understand that training your dog can be difficult unless you have the skills required. At the same time, training is crucial if you are looking towards having a well-behaved dog who doesn’t embarrass you when out on walks, frighten the postman, or knock over your guests as they walk in through the door! This is where Bark Busters come in. I will visit you in your home and listen to you as you explain to me the problems you are having. Then we will work together using our unique system of communication to put a stop to the confusing commands and inconsistency of the past, and finally allow your dog the luxury of confidence in you as someone he wants to listen to. My experience has taught me that dogs are very willing to listen; they just don’t always understand what we are telling them. As I show and guide you through the training system, you will gain the skills and confidence to allow you to teach your dog the way you want him to behave. And because our system is gentle, and non-physical, and involves lots of praise, you dog will start to love his training sessions interacting with you rather than ignoring you. During my career I have worked with many different types of household, and with many different breeds of dog. There are very few dogs without the potential to become well-trained, well-behaved member of a household. My job is to teach you how to achieve that. 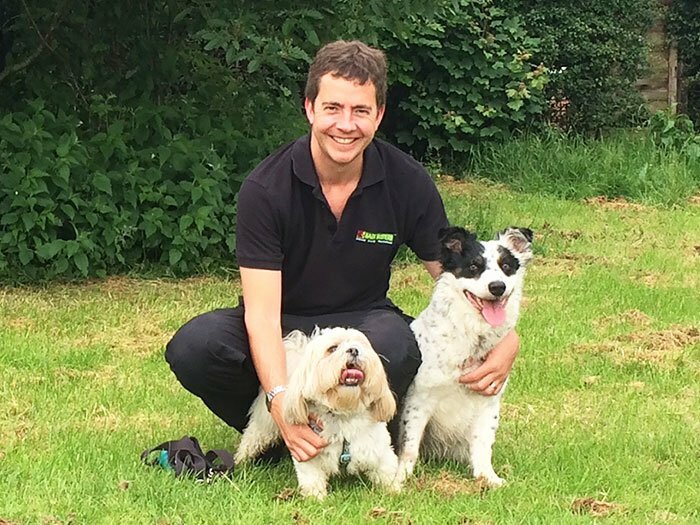 Whether your issues are aggression, pulling on the lead, recall, separation anxiety, barking, jumping up, or many more, I am confident that I can help you to overcome the problems and build a new, better relationship with your furry friend. You will receive written advice and a training plan to follow after our very first session, and our written guarantee gives you peace of mind that I will return to support you with your ongoing training free of charge throughout your contract. I also specialise in working with people who have taken in a rescue dog that may be struggling to adapt to his new surroundings. These dogs need lots of patience and time to settle and adjust to boundaries, but they don’t particularly need to be smothered with love – just kind, consistent leadership, communication and interaction; things that our system will bring to you. I love working with puppies, and can help you will all aspects of training your puppy from when you first bring him home, through to leadwork and recall. Puppy sessions are gentle and fun, and take into account the puppy’s short attention span and ned for sleep. I will provide you with lots of guidance on toilet training, dealing with mouthing/chewing, and playing with your puppy to establish a relationship that can also help with training. Also visit my Home Dog Training in Manchester North website. Experts in dog training and behaviour for Rochdale, Bury, Oldham areas. Cure embarrassing habits like barking, jumping up on people, scratching & whining at doors or inappropriate toileting. Create an obedient dog or puppy that will happily walk on the lead without tugging, sit or stay on command, and come immediately when called. Reduce the stress of separation anxiety without the need for sedatives or drugs. We teach you to communicate with your pet. Do you find yourself shouting? Do you think your pet isn't listening to you? Maybe you're simply not speaking their language. The Bark Busters communication method is based on the way how our dogs communicate with each other and how they learn from older, more experienced members in the pack. This is what makes our training unique and effective. Why do we train in your home? Your pet lives with a family, in a home. This is where he spends most of his time and misbehaves most often, so this is where our programme is most effective. Our dogs learn by association. Bark Busters teaches him to listen in the home environment. If he does not listen at home, he will most probably not listen outside where there are far more distractions. In your home we teach a one-on-one system without other distractions or the stress of being sent away from you to learn. Of course, where you are experiencing problems outside the home such as pulling on the lead or dog aggression etc..., we will set up controlled situations in the park or wherever is most practical. 98.6% of my clients rate their experience with Bark Busters as 4 or 5 out of 5 stars. 99.1% of my clients would recommend Bark Busters to their friends and neighbours. 98.6% of my clients think that their dog responded to the training. Average rating 4.9 out of 5 based on the last 213 reviews out of 213. Excellent . Really pleased with the results . I was left with plenty of information to work with . I was very anxious at first due to my dogs behaviour and at the end of the first session I felt more relaxed . The way Alex presented his advice was clear, simple and amusing. He was a great help and we really felt we had received goog value for our money.